Asbury Park, only in our minds and pictures today. The end of Asbury Park’s role as a seaside resort area is a sad thing for many people that once played there. The palpable sadness you can read about (save tillie and this photo essay) is partially a result of the fact that it has occurred in recent times . The decline of places like Long Branch and Atlantic City happened so long ago that there are way less people to bemoan their fate. Those that do remember those places are likely people that were children many, many years ago. They do not have much in the way of offering up their ideas on the internet. I’m sure thought these losses were just as hard to take in their time. There was also no modern day Bruce Springsteen to bring popular attention to the loss of those other places. So I would suggest all of this represents “progress” but still – it is difficult and sad to lose what Asbury Park once had if the amusements and beach were something you once enjoyed. The losses at Asbury were especially sad for many reasons. The beginning of the end began with race riots. A sad and difficult time for many people, for sure. The most recent episodes in the end to Asbury’s past too were both sad and somewhat indicative of what resort economies are like. For most people the shore is about memories built up around vacationing or otherwise enjoying themselves. For business people it is just that – business. What can yield the best return? Parting people from their money is the reason shore resorts built up in the first place. If there is some other way to make a buck there is a strong incentive to follow that instead. This is sad but true and most people do not want to really acknowledge that part of things when it comes to losing something they love – a tangible symbol of idyllic times from their childhood. The loss of these symbols was even more shattering because of the way two of the most important elements of Asbury’s shore past were destroyed. 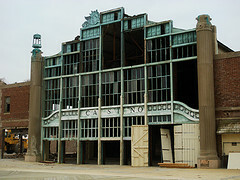 The Casino, pictured above, has been largely torn down. The orginal carousel building and a portion of the structure that is part of the boardwalk is still in place, but the Casino as a whole is but a remnant shadow of its former self. The Palace on the other hand is gone. The development that was supposed to replace the palace was a total failure. You could say it was torn down for nothing. I don’t know the story behind much of what has gone on in Asbury, other than to know it is a long tale of many schemes and strange politics. What I do know is that I was at the Stone Pony somewhere around six years ago and saw that ugly skeleton of failure that sat on the beach then (scroll down this webpage to see some pictures of this place). It was very eerie to see that large shell of that unfinished building sitting there. It wasn’t just ugly, it was disturbing in a way that did not really make much sense. So from this many have suffered the loss of the Casino and the Palace being destroyed not just for some ignominious development that never came. They have seen their memories ridiculed by an overly public failed redevelopment scheme. Rather than the places around where these monuments once stood holding some shiny new progress in the form of nice new buildings, the scene is like the place where a senseless murder took place. No reason – just sad loss, like the rubbing of salt in a wound. At some point I think Asbury will get beyond all this recent sadness, failure and inability to move forward. The only question is will it be in the next decade or sometime longer in the future. It also remains to be seen what it will become. Shore boardwalk amusement areas are clearly dinosaurs. A few hang on and still thrive but it seems unlikely a new Seaside Heights boardwalk could be built – and succeed – today. Photo attribution MRVJTod…..thanks for sharing this image! Previous post: The Jersey Shore, mainly yesterday.